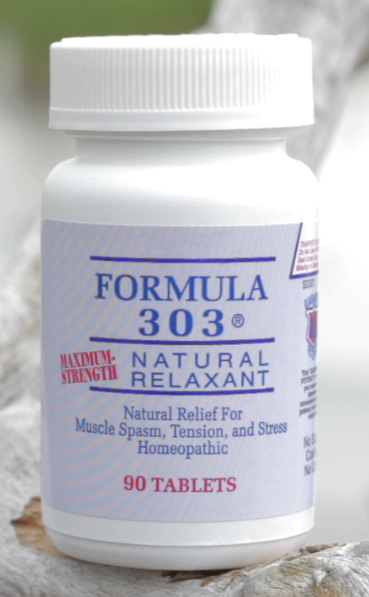 Formula 303 is a combination of two herbs, Valerian Root and Passiflora, and one mineral, Magnesium. It acts to relieve muscle spasms, tension, and stress. Valerian Root (Valeriana officinalis) - used for centuries to calm upset nerves and for treating mood problems, pain and headache. Today homeopaths and herbalists use Valerian root for its antispasmodic, calmative, tranquilizing, carminative (good for upset stomach and digestion) and pain relieving effects. Passion Flower (Passiflora incarnata) - discovered in 1569 it is primarily used as a sedative or nervine to combat excess nervousness and anxiety, to tranquilize, and to promote sleep; as an anodyne, anti-spasmodic and anti-convulsant to treat dysmenorrhea, muscle cramps, and so forth. FORMULA 303 IS MADE FROM NATURAL INGREDIENTS AND MAY HAVE A DISTINCTIVE ODOR . . . Now Faster-dissolving and Quicker-acting. The name Valerian comes from the Latin word valere, meaning "to be strong or healthy", generally thought to refer to its medicinal use, though many references suggest that it also refers to the strong odor. In researching the use and effectiveness of Valerian Root, many sources tell us that it has been found to be effective for the relief of muscle spasms and nervousness with a resulting calming effect on the system. The Merck Index and other sources support the fact that Passiflora is an effective calmative and mild analgesic. Passiflora seems to reduce perception of pain, and has been used for neuralgia, shingles, and general nerve pain. It is very helpful during the menopause, when falling hormone levels can make women prone to anxiety and depression. it also has antispasmodic properties, it can reduce the muscle spasms and gastric spasms hat often accompany stress. A Magnesium deficiency may cause irritability of nerves and muscles resulting in muscle spasms, leg cramps, nervousness, and backache. Formula 303 was 80-85% effective for the relief of muscle spasms, tension, and stress. Formula 303 is not habit forming and has no after effect. There have been no reported adverse reactions from taking Formula 303 with other medications. The recommended dosage for adults and children 12 years of age and older for muscle spasms is two tablets with each meal and two at bedtime. As a relaxant for tension and stress, take two tablets with each meal and two at bedtime. The dosage may be decreased to one tablet or increased to three tablets depending upon the weight of the patient. WARNINGS: If you are pregnant or nursing a baby, seek the advice of a health professional before using this product. KEEP OUT OF REACH OF CHILDREN. In case of accidental overdose, seek professional assistance.